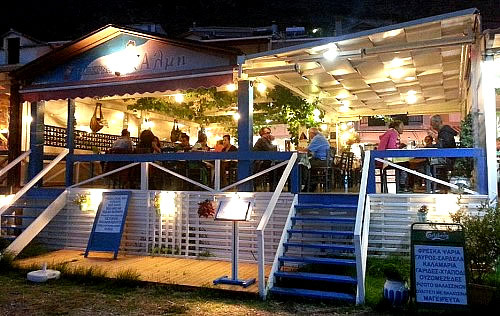 Along Vassiliki Bay in the area known as Ponti is Internationally Acclaimed - Taverna Almi. Holiday makers to the windsurfing paradise of Vassiliki on the Greek Island of Lefkada always head to Taverna Almi for their delicious lunch and evening meals. At Taverna Almi you will not see appliances like microwaves. Maria and her experienced and dedicated team in the kitchen cook everything from fresh and the food is absolutely delicious. All food served at Almi is grown / reared locally on the Island and is cooked using locally produced olive oil. The fish at Almi is caught daily by local fishermen, so you cannot find fresher fish on offer. Aris, George, Spiros and Antonio will offer you a very warm welcome on your arrival for lunch or dinner and they will ensure you are wined and dined to the very highest standard in an extremely friendly and warm environment. Taverna Almi offer their diners a very wide and varied menu which include fish, chicken, beef, pasta, pizza and a host of Traditional Greek Dishes. A food take away service is also available as well as breakfast. All the staff at Taverna Almi (Ταβερνα η αλμη) look forward to welcoming you to their very popular restaurant.